Fantastic new Tailgate Party options and location! We’re very pleased to announce that we have upgraded and moved our tailgate parties for all Home Packers games under our new partnership with the Bar on Holmgren Way. 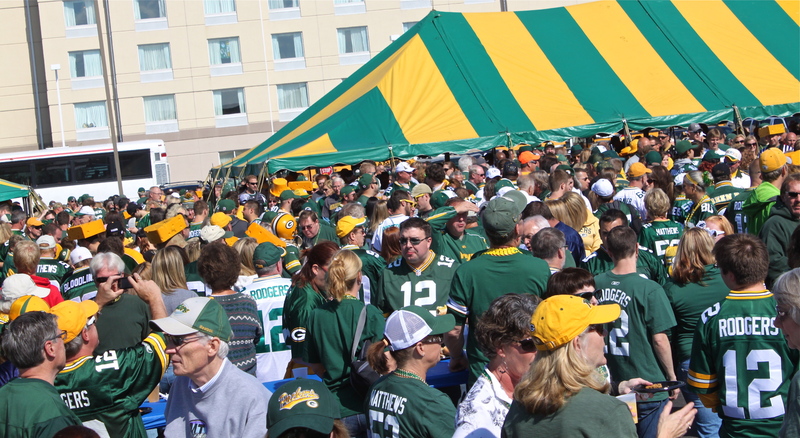 Conveniently located near Lambeau Field, our two pre-game party choices, the Traditional and the VIP, will offer as always unlimited food and beverage and an energetic pregame party atmosphere, with music, prizes, and a Packers alumni player. AND the VIP party will offer a completely open bar and many more choices to tempt your pallet and quench your thirst before the game. We are always looking to improve our services and know you’ll be pleased. Our tailgate parties are included with all our Bronze, Silver and Gold game packages and day of game packages, and are also available for individual purchase at great value prices. We can’t wait to see you on game days at our tailgate parties at the Bar on Holmgren Way! For more details, click here.